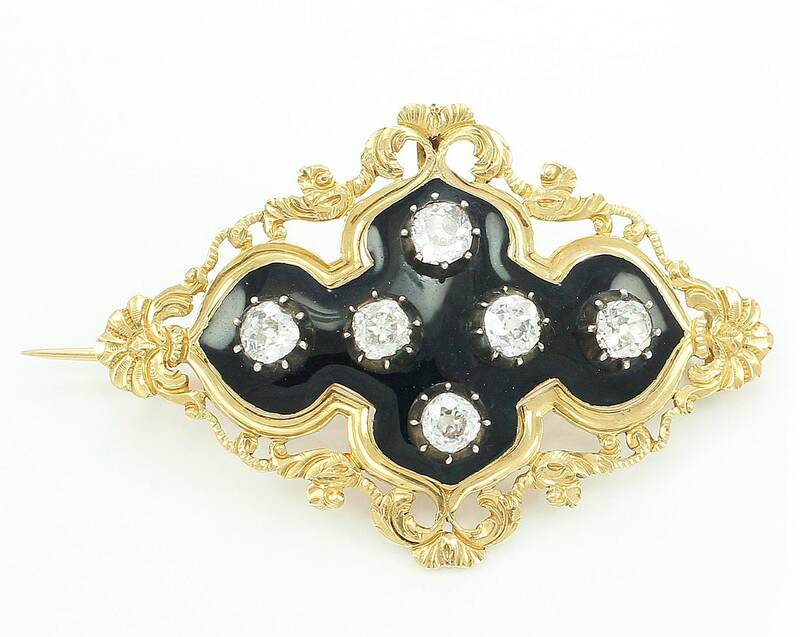 ANTIQUE Georgian Regency 18K Yellow Gold 1.85 CT TW Old Mine Cut Diamond & Black Enamel Mourning Brooch. What a showstopper! 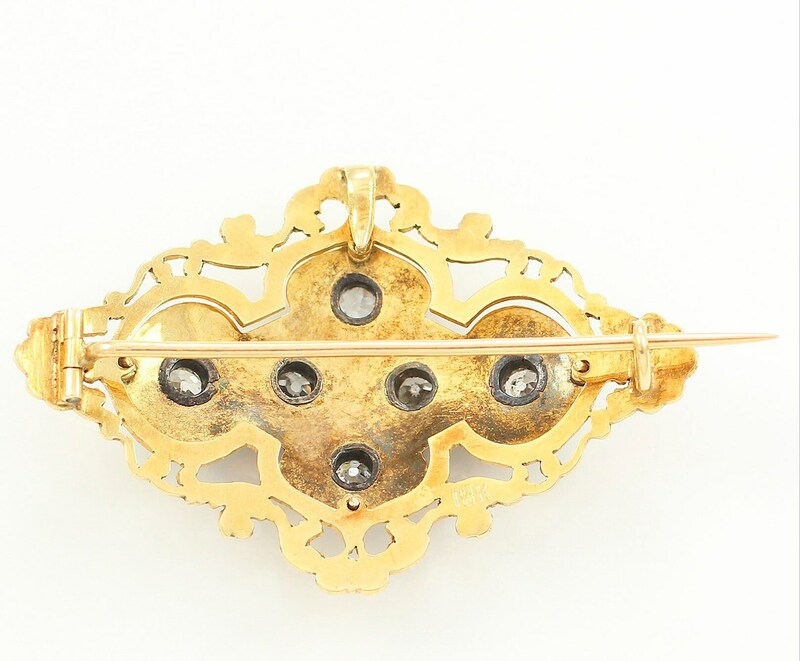 This gorgeous antique brooch in elongated quatrefoil form dates from 1815 to 1830. It features six very irregularly hand cut diamonds in a mix of Old Mine Cut and Cushion Cut shapes. Each diamond is set in an eight prong silver mounting that is guaranteed to be at least .925 silver. Each diamond measures approximately 2.95 mm in diameter. The total weight of the diamonds is 1.85 Carat. Diamond Clarity is SI1 to I2 and the Diamond Color is F-I. 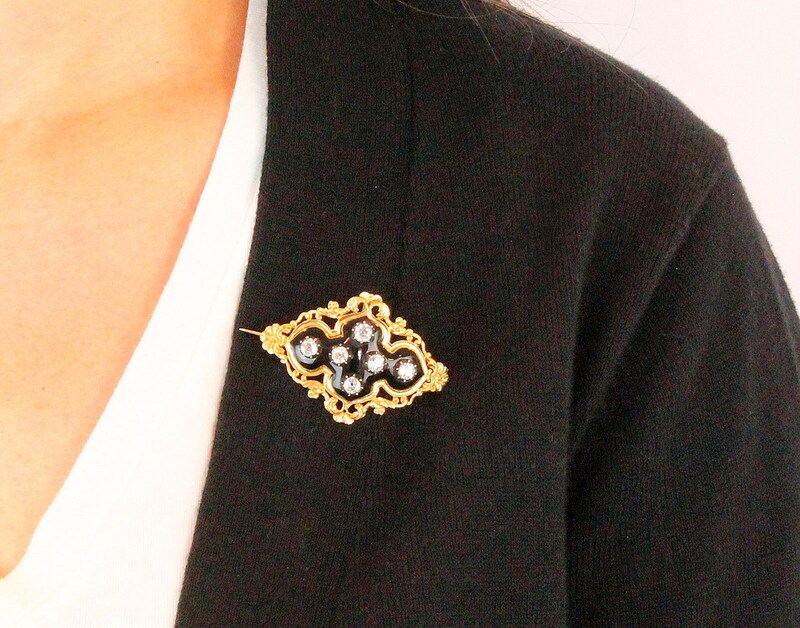 The stones are set on a field of black enamel on 18K yellow gold with elaborately hand chased and pierced filigree border frame. The extremely long hinged pin stem is secured with a curled wire C clasp. There is a hook which may have once held a separate pendant. 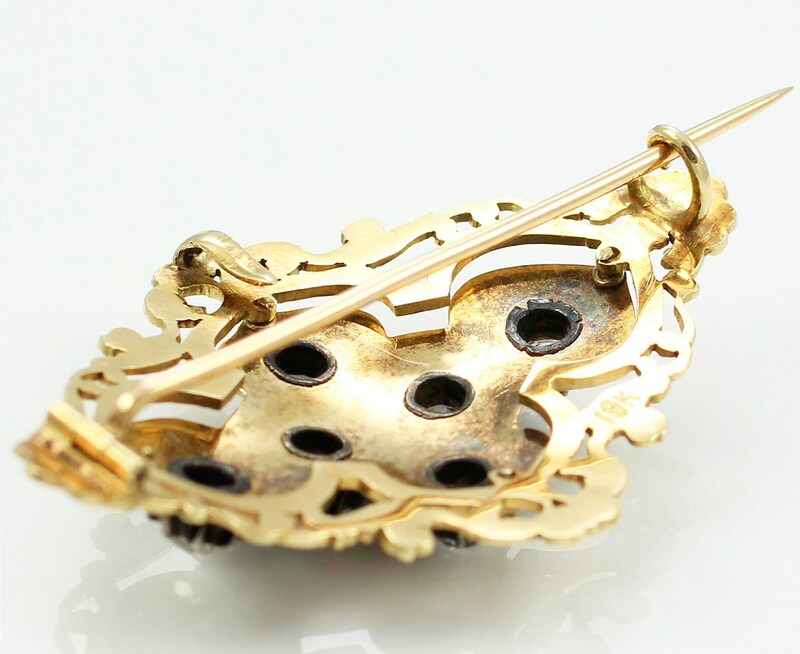 You might be able to use this to suspend the brooch as a pendant, but we do not feel that would be very secure and would recommend having a jeweler professional adapt the piece for wear as a pendant, should you so desire. This piece was created by hand long before hallmarks and stamps were common and is probably of European origin. It was later engraved "18K" and we have confirmed this karat. We are pleased to offer this rare treasure. 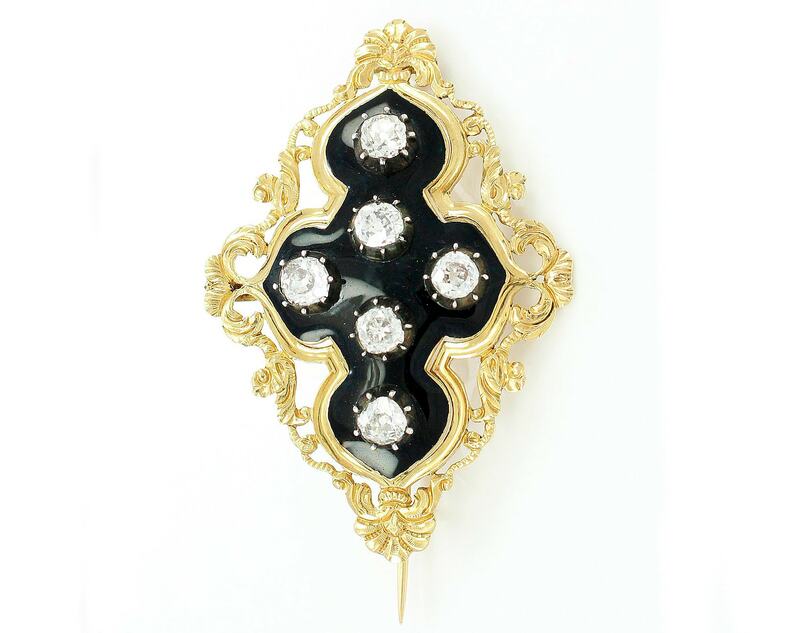 METAL/MATERIALS: 18 KT Yellow Gold, Black Enamel, Six Old Mine Cut Diamonds. All diamonds have very high crowns, small tables, and large, open culets. They have irregular girdle outlines, as expected in hand cut diamonds of this era. CONDITION: In very good antique condition, with no damage noted. 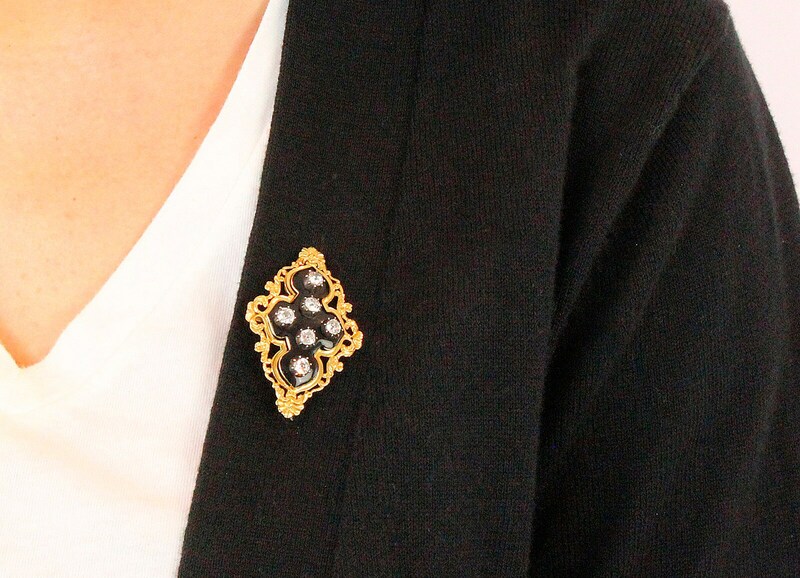 MEASUREMENTS: Brooch measures 1.88 inches by 1.25 inches.